Have you ever thought about the design of a house and how usually a dining room is adjacent to a kitchen and a kitchen is adjacent to a family room, and the bathroom tends to be centrally located so that it is accessible from several different locations? 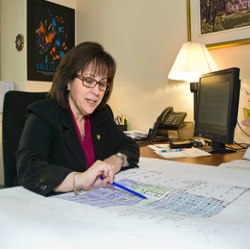 Like the placement of the rooms in a home, Imma Franco, associate director of Planning for Programs & Services for the New MUHC, and her team of planners are in charge of overseeing adjacencies at the Glen Campus, a process by which they decide what goes where. From the Emergency Department to the laboratories, everything and everyone is taken into consideration. Meant to enhance functionality, adjacencies are conceived of with the patient and family experience in mind: the easier and more efficient it is for a patient to receive care and get around, the better. This goes for patients with limited mobility too. “Well-designed adjacencies improve the use of space: not only are spaces arranged with everyone’s various needs in mind, the fact that more things are ‘co-located’ (near each other), means that a patient’s time and displacements in the hospital are more contained,” says Ms. Franco. For instance, if a woman arrives at the hospital ready to give birth, she will be admitted in the same area of the hospital where she will deliver. Each sector of the hospital is independent but interconnected, allowing for better patient flow. In streamlining activities, adjacencies not only benefit patients, they also benefit healthcare specialists whose time and efficiency are maximized when services are near each other; it also affords them the chance to interact with colleagues, thus enhancing collaboration between various fields and ensuring that patients receive the holistic care they are looking for and deserve. This also benefits medical students, as they are exposed to a more integrated approach to practicing medicine. The benefits of adjacencies and the collaboration they create can be seen on a much bigger scale as well. The Glen Campus is a good example; when the building is complete, it will regroup the Montreal Children’s Hospital, the Royal Victoria Hospital, the Montreal Chest Institute, a Cancer Centre, the Research Institute, and the Shriners Hospital. Having so many institutions in such close proximity gives patients the chance to be easily transitioned within the hospital complex – a practice that is unique to the MUHC in Quebec. So, if a child is diagnosed with diabetes, when he becomes an adult he can easily transition over to the adult hospital. He will continue to be cared for in the same way he has been for his entire life, his doctors can easily interact, and the surroundings remain familiar. The adjacency of all the different hospitals also creates an excellent research and teaching environment in which information is openly shared between researchers, healthcare professionals, doctors, and teachers and students. Thus, in addition to making sure that healthcare flows smoothly and easily down to patients and their families, adjacencies are also about being able to work openly and harmoniously across hallways, buildings and even medical fields.